Eye protection is critical when running a chain saw. Wire-Mesh goggles have increased ventilation, and eliminate the possibility of fogging. Meanwhile, safety glasses or goggles offer unobscured vision and have more impact resistance. Eye protection used by arborists and tree workers should conform to the ANSI Z87.1 standards according to the new ANSI Z133 safety requirements for arboricultural operations. Zorge glasses block 99.9% of UV rays while providing lightweight, comfortable eye protection. Gloss black nylon frames with soft temple tips for a comfortable fit. ANSI Z87.1-2010 (high impact) compliant. In addition to the high level of impact protection, UV-blocking, and safety of regular Zorge glasses, these safety glasses have Vapor Shield "Military-Grade" anti-fog. These glasses are completely resistant to haze, fog, and condensation in the most extreme conditions and temperatures. Matte black nylon frame with soft temple tips for a comfortable fit. ANSI Z87.1-2010 (high impact) compliant. Safety glasses block 99.9% of UV rays. Available in anit-reflective, polarized (tinted or yellow), and smoke lenses. Foam Gasket Kit is avialable to add to your glasses. If you're working a tree with very fine sawdust, or there's a lot of dust in the air, you'll appreciate how the gasket seals your glasses to your face to keep out particles. Safety glasses block 99.9% of UV rays. Camo nylon frame with soft temple tips for a comfortable fit. ANSI Z87.1-2010 (high impact) compliant. Optional foam gasket is available. This self-adhesive liner is easy to apply to your Dakura safety glasses. Includes anti-fog spray. Nemesis safety glasses are durable, sleek, and most importantly provide excellent impact-protection as well as blocking harmful UV light. The wrap around frame is flexible which makes the Nemesis glasses comfortable to wear at the temples and also helps keep the frame from breaking or deforming. Nemesis lenses are tinted in your option of colors and coated with an anti-fog agent. Nemesis safety glasses are the best combination of safety, style, and comfort. Each pair comes with free cord keepers. Nemesis safety glasses meet ANSI Z87.1 as required by the ANSI Z133-2017 Safety Requirements for Arboricultural Operations. The 'Ossa' safety glasses fit comfortably over your prescription glasses. Safety glasses block 99.9% of UV rays. Polycarbonate matte-black frame with clear or smoke lenses. Clear lenses allow 85% of light to pass through. Smoke lenses allow 16% off light through. Both are ANSI Z87.1-2010 (high impact) compliant. Case savings! Order 12 sets of glasses to get case pricing of $40 per case - $3.33 per pair! Very popular plastic safety glasses feature increased the coverage on the sides of the eyes. Tinted lenses cut down on glare and protect at the same time. Non-streaking fog eliminator cloth help keep your vision clear when using safety glasses or goggles. Alcohol and silicone-free. Safe Eyes mesh goggles are back! Safe Eyes are extremely comfortable, lightweight, and are excellent for keeping sawdust and out of your eyes. Safe Eyes are available in a standard mesh with .7mm holes which meet the ANSI Z87.1.2010 standard for impact protection, or a finer .35mm mesh which is not impact-protective but will keep finer dust particles out. The flexible, lightweight frame molds seamlessly to the face for a comfortable fit and perfect seal. Safe Eyes will never fog thanks to their stainless steel mesh construction, and they offer great protection and field of vision. The Elvex AirSpecs with stainless steel mesh are designed to protect the eye socket from pokes and prods of stationary or very low energy, non-fragmenting objects over 1 mm in diameter. Great for humid environments...GUARANTEED Not To FOG! The Bug-Eyez are our most popular eye-protection. The mesh screen is available in medium or fine and keeps saw dust and debris out of the eyes, and unlike regular safety glasses they will never fog. Elastic strap keeps them comfortably in place in the most hectic work situations. Not impact resistant. Aluminum frame and fine wire mesh mold to the individual user. Best in ventilated eyewear, will never fog. Not designed to stop impact, but keeps out chips and debris. Large mesh screen that curves out from the face makes these goggles great for people who need to wear protection over their eyeglasses. Adjustable elastic headband. Diamond Clear Anti-Fog Safety Glasses/Goggles w/ Foam Gasket New in 2019! Clear safety glasses with foam gasket to prevent fogging. 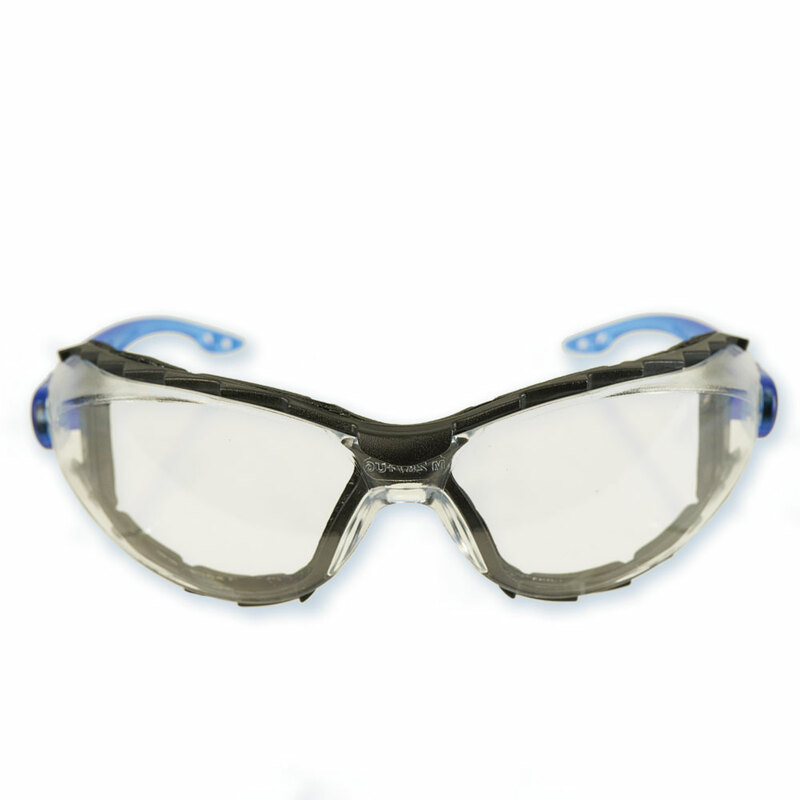 Can also be quickly converted to goggles by replacing the frame tips with included goggle strap. Goggles will fit over glasses and have a silicone face seal which fits comfortably to the face. These goggles grant a full range of vision, a comfortable fit, high impact resistance, and have a special coating and indirect venting to minimize fogging. These goggles are bound to become one of our best sellers. Petzl Vizir eye shield is a clear, hard plastic visor compatible with Petzl Vertex 2 and Alveo helmets. Kask's Visors for the Kask Super Plasma and Super Plasma Hi-Vis helmets are a popular add-on that provides eye-protection and sits close to the helmet. The Visor overlaps the edge of the helmet for a seal that keeps out water, chips, etc. Available in 3 colors - clear, smoke (grey), or mirrored. Replacement screws for the Kask Visor are also available. Mesh visor for Kask Super Plasma helmets. Full kit contains all items needed to mount the helmet visor, or you can order individual components. Provides full-face protection. Kask's new Zen visor fits the Kask Zenith helmet when used with the Visor Adapters (sold separately). Kask's metal mesh visor fits the Kask Zenith helmet when used with the visor carrier.